The Challenge vs. 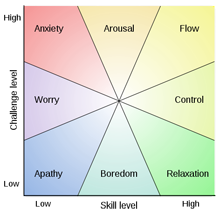 Skill diagram, showing the "Flow" region of Mihaly Csikszentmihalyi's Flow Model. Boredom is characterized by low challenge and moderate skill. That is, we're at risk of boredom when we're fairly competent at doing what must be done, and it presents little or no challenge. When many employees find themselves in this situation, the organization is at risk, both from voluntary terminations and from insufficient attention to benign but evolving situations that eventually become critical. Many authors have observed that a significant fraction of all business failures occur when top executives become bored. The diagram is by Oliver Beatson, and it's available at Wikipedia. It seems clear to me that we're more likely to thrive when we're plugged into Reality. And I've noticed that some people who are bored at work are unaware that they are, because they find things to do that disguise the boredom, or at least make it more tolerable. For these people (a little tongue-in-cheek) I offer this list of boredom indicators. You can't sleep at night, so you sleep at work. You've figured out how to sit at your desk so that nobody can see that you're actually sleeping. You wonder if anyone heard that snore when you woke yourself up just now. On the way to the coffee machine you look down at your coffee cup and you notice that you already have coffee. You look forward to your bathroom break. You just arranged lunch with two people you can't stand, just to get out of the office. During lunch, you find yourself thinking about what to have for lunch tomorrow. You're usually current on your expense reports. You look forward to required training. It's all you can do to keep yourself from correcting obvious typos in Wikipedia. You correct obvious typos in Wikipedia, but you do it under an assumed name. No matter what you're doing, if it's work-related, you feel relief when you're interrupted. At work, you surf the Web looking for a new job. You do your Web errands (shopping, gifts, etc.) at work. No point wasting time at home on this stuff. You've learned the keyboard commands for quickly displaying the next or previous browser tab so you can switch quickly to a tab more suitable for work when someone suddenly enters your office. You listen carefully to the phone conversations of the person next door. You look at your boss's home in Google street view — again. You got pretty good at some of Google's more arcane commands by searching for your ancient love interests. pointing the same wayto spy on your dog sleeping on your sofa at home. All your paper clips are pointing the same way. All your paper clips are pointing the same way except the ones that you intentionally turned around so that they wouldn't all be pointing the same way. You've discovered that your office is in a time warp, because the clock, while not actually stopped, is moving so slowly that it might as well be stopped. You send long email messages to colleagues debating the finer points of stuff that even you don't care about. You send email messages that are so long that if you were a recipient, you wouldn't read them. Under an assumed name, you hold the daytime North American record in an Internet computer game. When a random question comes into your head (like which tree species leafs out first in springtime) you immediately get onto the Web and find the answer. And the Number One Indicator That You Might Be Bored at Work: You've read all the way through this list to get to the number 1 indicator that you might be bored at work. Would you like to see your comments posted here? rbrenSondhmDGNKtponflner@ChachiqrlnspiyNhveyFoCanyon.comSend me your comments by email, or by Web form. I offer email and telephone coaching at both corporate and individual rates. Contact Rick for details at rbrentvtObvtpgrZMIyoZner@ChacweusLfejrRyoNQSpoCanyon.com or (650) 787-6475, or toll-free in the continental US at (866) 378-5470.